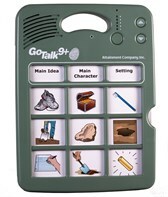 The Go Talk 9+ Lite Touch is a new addition to the range offering significantly improved touch sensitivity. 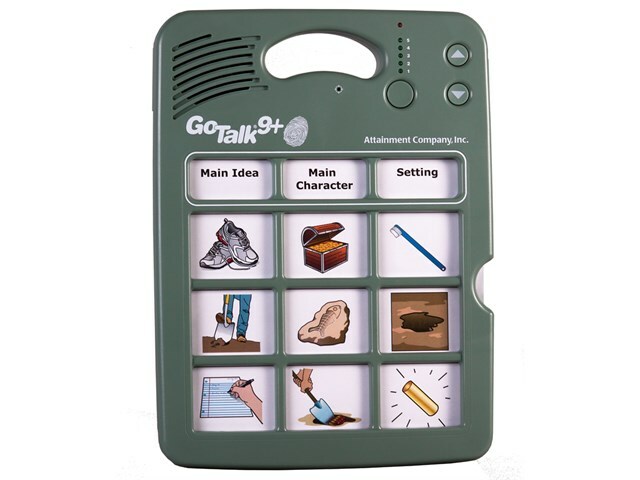 A powerful, portable, easy to use and very durable speech output device. Use it as an introductory communication aid and also for curriculum enrichment. Includes 5 levels on each of its 9 message keys. Also has 3 useful 'core' message keys that stay the same on each level. Provides great sound and volume control, plus easier sequential recording, an option for whole level erasing and built-in overlay storage. Its light weight and built-in handle make the Go Talk 9+ Lite Touch very portable. It is slim enough to fit into a backpack and attractive enough to use every day, anywhere. 5cm square buttons with built-in keyguard help the user select the right message. Change levels with a press of a button. Overlays are stored inside and slide in and out easily. Adjust the volume by pressing up and down buttons. Two AA batteries (included) last a long time.